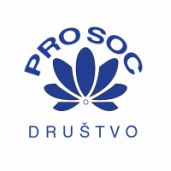 ProSoc, Society for project implementation and social entrepreneurship development is a voluntary, non-profit, humanitarian, interest association of citizens of the Republic of Slovenia. equal decision-making and participation of the members. Our vision is to improve the quality of life of socially vulnerable groups of peaople. We act as a partner in a national project "Advocate - A child's voice", which is lead by slovenian Human Rights Ombudsman office.